The 2 humps of the Bactrian camel store fat, not water. The fat is used as food during times when there is little to eat. Camels conserve body water in unique ways. They raise their body temperature when it is hot so they will not sweat. Little water is released through urine and feces. When a camel has gone several days without water, it may drink up to 120 litres (28 gallons) at a time. To keep out blowing sand and dust, these camels have a special transparent (see-through) eyelid. The long lashes also help to keep the sand out of their eyes. The two broad toes on each foot have undivided soles that are able to spread widely. 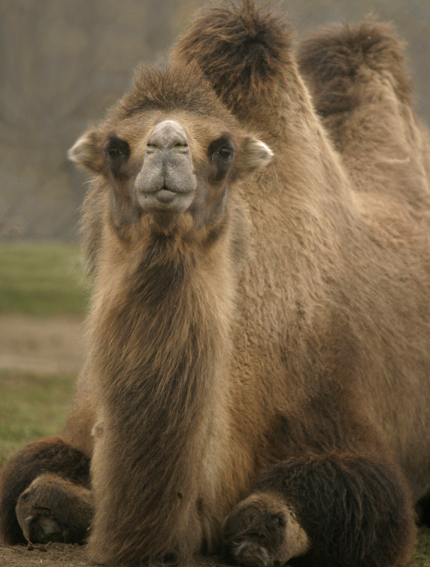 This allows the Bactrian camel to travel easily on shifting sand or on rocky outcrops. The upper lip is split for grabbing leaves and bark from trees.